Australia is known for their Kangaroos, Koalas, Tasmanian Devils, and every other species of animals you could think of. Little did we know, it's also a birthplace of a different breed of cars. No, we're not talking about Holdens; we're describing this: a BMW M3 powered by a 10,000-RPM RB26 engine inside its bonnet. That's right – the E92 M3 is already an awesome car by itself. However, its owner Jake Jones, also known as DriftSquid, fitted it with the very heart of a Nissan Skyline GT-R. Looks like DriftSquid wants to unleash the Kraken with his car. The most interesting part of this build is the engine swap employed to it: the 2.8-liter RB26 inline-six mill that produces 844 horsepower and 590 pound-feet of torque to the wheels when ingesting E85 fuel. The whole engine setup is a bit of a mixed bag but its an N1 RB26 block with Tomei 2.8L stroker kit and custom RB26DETT head. It then has a BorgWarner 9174 EFR turbocharger, Hypertune intake manifold, and MoTeC M150 ECU. Power is sent to the rear wheels by an HGT Precision five-speed sequential transmission with a Direct Clutch twin plate clutch, custom two-piece driveshaft, and Winters Performance 10.5-inch rear end. Converting a luxury performance coupe into a drift car isn't easy, but it looks like only the body of the M3 was left in this build. What's impressive is how neat this build is. The welded joints are fine and the engine bay isn't crowded. It's aesthetically awesome. 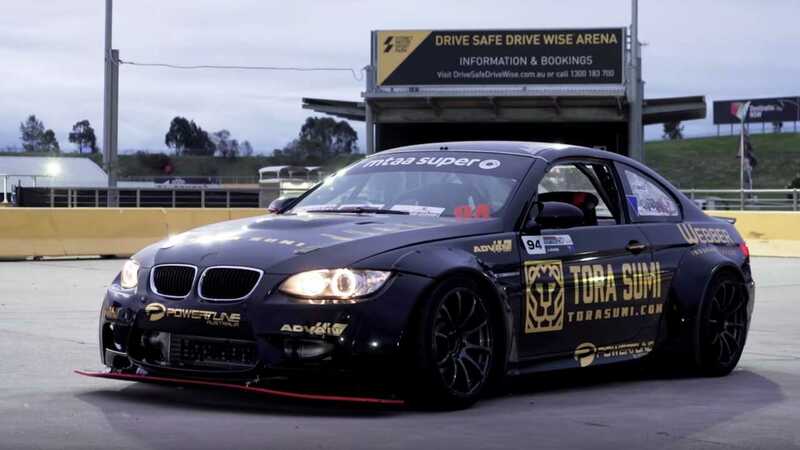 Props to Powertune Australia for breathing life into this drift beast. While this drift car is all good on paper and in aesthetics, one would really appreciate it really better when heard. Watch the video on top of this page and experience it yourself. Don't forget to put your headphones on.